The Public Sector Pension Investment Board (PSP Investments) recorded an investment return of 16.3% for the fiscal year ended March 31, 2014. The performance was driven primarily by strong results in public market equities as well as in the private equity, renewable resources, real estate and infrastructure portfolios. The fiscal year 2014 investment return exceeded the policy portfolio return of 13.9%, representing $1.8 billion of value added over the benchmark return. Consolidated net assets reached a record $93.7 billion, an increase of $17.6 billion, or 23%, over the previous year. PSP Investments generated net investment income of $12.6 billion for fiscal year 2014 and received $5 billion in net contributions. For fiscal year 2014, returns on public market equities ranged from 6.1% for the emerging market equity portfolio to 38.7% for the small cap equity portfolio. The fixed income portfolio generated a return of 4%, while the return for the world inflation-linked bonds portfolio was 6.9%. In private markets, all asset classes posted solid investment returns for fiscal year 2014 led by private equity and renewable resources with returns of 24% and 20%, respectively. Real estate recorded a 12.2% investment return, while the infrastructure portfolio earned an investment return of 9.4%. The private asset returns reflect the currency hedging of these assets. The asset mix as at March 31, 2014, was as follows: public market equities (52.8%), nominal fixed income and world inflation-linked bonds (17.7%), real estate (11.4%), private equity (9%), infrastructure (6.4%), cash and cash equivalents (1.9%) and renewable resources (0.8%). The pension plan for federal government employees earned a 16.3-per-cent return last year, beating its investment benchmarks and pushing assets under management to almost $94-billion. The Public Sector Pension Investment Board, which invests pension funds for federal civil servants including the Canadian Forces and the RCMP, said Thursday its assets climbed by $17.6-billion in the year ended March 31 – an increase from $76-billion last year – due to huge stock market returns and strong results in private equity and real estate holdings. PSP Investments, Canada’s fifth-largest pension fund manager, said it earned $1.8-billion in value above its passive benchmark return of 13.9 per cent last year. “Once again, performance was strong across the board with all investment teams contributing to value added over benchmark returns,” said interim chief executive John Valentini. Mr. Valentini was appointed in June following the resignation of former CEO Gordon Fyfe, who left to head B.C.’s pension fund manager, British Columbia Investment Management Corp.
Mr. Valentini said PSP has outperformed the long-term return target it needs to hit to meet its projected pension obligations. On a 10-year basis, the fund has earned an average annualized return of 7 per cent, which translates into a return of 5.2 per cent after inflation is taking into consideration. The Chief Actuary of Canada said federal pension plans needed to achieve an average return of 4.3 per cent after inflation over the past decade. Like many pension funds, PSP’s returns in the past year easily topped gains in other recent periods due to steep improvements in stock market returns. The fund’s 16.3-per-cent gain in fiscal 2014 exceeded gains of 10.7 per cent in 2013 and 3 per cent in 2012. The fund said gains from its public market stock portfolio ranged from 6.1 per cent in emerging markets to 38.7 per cent for its small cap equity portfolio. Private equity investments climbed 24 per cent last year, while renewable resource holdings were up 20 per cent and real estate climbed by 12.2 per cent. The fund said it holds just over half its assets – 53 per cent in public market equities – while fixed income and bond investments total just 17.7 per cent of its assets. The remainder of its holdings are in real estate, private equity, infrastructure, renewable resources and cash. You can read the press release PSP put out on their FY 2014 results here. More importantly, take the time to carefully read the FY 2014 Annual Report here. It is extremely well written and provides an in-depth discussion on performance, governance, risk and compensation. The most critical component with respect to the strategic Goal No. 1, Portfolio Management, is the Policy Portfolio, which essentially stipulates how every dollar transferred to PSP Investments is allocated to asset classes. A key Board responsibility, the Policy Portfolio is reviewed annually. The review focuses on the liability structure under the pension plans and examines the appropriateness of the Policy Portfolio to meet these liabilities. This examination includes a major focus on PSP Investments’ long-term capital market assumptions and related methodologies, which are key inputs in the design of the Policy Portfolio. Enhanced scenario testing has been undertaken to validate potential outcomes. Consideration was given during fiscal year 2014 to adding or expanding asset classes. However, we concluded that the current Policy Portfolio, with its target of 42% Private Markets investments, remains effective and should enable PSP Investments to meet or exceed its long-term rate-of-return objective (4.1% after inflation), with an acceptable level of risk. Supporting this conclusion is the fact that, over 10 years, PSP Investments has outperformed the return objective by 0.9% per year. This excess return per year translates into a cumulative $7.7 billion of investment gains when taking into account the size and timing of cash inflows. I will come back to PSP's Policy Portfolio later on but let me tell you right away, the next ten years won't look anything like the past ten years and PSP's board will need to take into account many factors, including the mad rush into private markets by global pension and sovereign wealth funds, when reviewing their Policy Portfolio. Finally, with regard to strategy, in light of PSP Investments’ increasingly global reach — with more than half our assets now invested in foreign markets — consideration was given to the desirability of opening offices in markets outside Canada. Upon reflection, the Board and senior management concurred that we continue to be well served by our current strategy, which entails working closely with select local partners to identify attractive potential investments abroad,while maintaining the organizational agility to respond quickly to such opportunities. In my opinion, opening up global offices is a waste of valuable time and resources and PSP's board and senior management are right, if you have solid partners in key areas, you don't need to open up offices and hire employees all around the world (CPPIB, OTPP, the Caisse will disagree but that's my opinion!). At year’s end more than $70 billion or 75% of consolidated net assets was being managed internally. Some $38 billion of that amount was actively managed by our own teams — representing an increase of 31% from the previous year-end. This contrasts sharply with the situation back in fiscal year 2004, when only $1.7 billion of assets were being actively managed in-house. While actively managing many of our own portfolios involved building the requisite high-calibre teams, it has enabled us to realize significant savings estimated at between $180 million and $265 million in fiscal year 2014 alone. Thanks in large part to the internal active management strategy, PSP Investments’ cost ratio has been trending downwards in recent years and compares favourably with peers in the Canadian pension investment industry. Moreover, results indicate that our internal investment managers have in many instances been significantly outperforming our externally-managed investments. Notwithstanding the increased emphasis on internal management, PSP Investments continues to forge strong relationships with select partners, including other leading pension investment managers...By way of example, it was thanks to our strong relationship with a prominent fund in the Asia-Pacific region that the Private Equity team was able to acquire a significant equity interest in a leading Asian life insurer during the latest fiscal year. With some $21 billion in assets, ING Life Korea is that country’s fifth-largest life insurance company. This investment fits well with PSP Investments’ aim of expanding its holdings in developing economies. In line with our increased focus on direct and co-investments, the Private Equity team also divested approximately $US1.3 billion of private equity funds during the year through a competitive auction process. Other noteworthy transactions during fiscal year 2014 included the Infrastructure team’s purchase of AviAlliance GmbH (formerly Hochtief AirPort GmbH), an airport investment and management company. AviAlliance held interests in the airports of Athens, Budapest, Dusseldorf, Hamburg, Sydney and Tirana which, combined, handle approximately 95 million passengers annually. The complexity of the transaction gave PSP Investments a competitive advantage to acquire an attractive portfolio of airports with long-term growth perspectives. It was another deal-intensive year for our Real Estate team, which completed the sale of its Canadian Westin hotel portfolio — one of PSP Investments’ first major real estate investments. 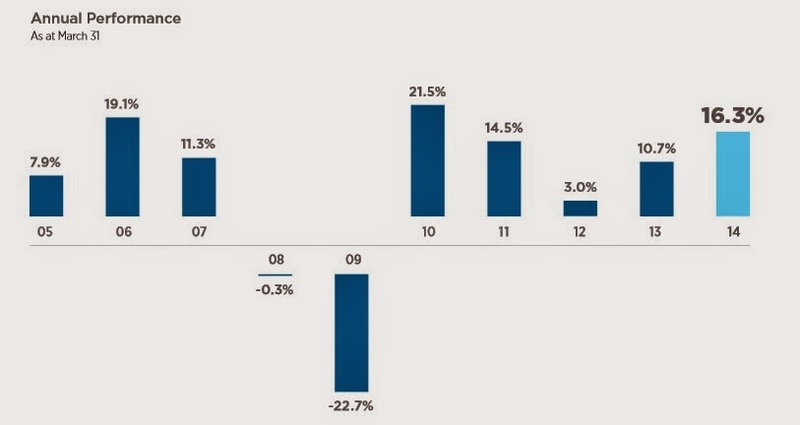 The transaction generated solid annualized returns of close to 15% over eight years. As well, Revera Inc., PSP Investments’ largest Private Markets holding, sold a 75% interest in a sizeable portfolio of Canadian retirement properties, thereby reducing PSP Investments’ exposure while allying Revera with a credible strategic partner. Significant Real Estate acquisitions included a 50% stake in 1250 René-Lévesque, a million-square-foot-plus Class A office tower in downtown Montreal that houses the main business offices of PSP Investments; and the purchase with several partners of a large office property strategically situated on Park Avenue in Manhattan. We also created a $1.5-billion (€1-billion) logistics joint-venture with London-based SEGRO, a leading industrial/warehousing property owner, manager and developer listed on the London Exchange. The joint venture involves 34 estates in Western and Central Europe, totaling more than 17 million square feet. Our Renewable Resources team formed a strategic agricultural joint venture with an established farmland investor and manager in Latin America, which will serve as PSP Investments’ platform for the further acquisition, development and management of farmland in the region. Again, this transaction is consistent with PSP Investments’ strategy to partner with best-in-class investors and operators in key regions. We have made significant investments to build a robust technology and data-management infrastructure to support our rapid growth. We continue to strengthen our capabilities in that respect, focusing on the implementation of scalable systems that can effectively handle public and private market transactions from end to end. As PSP Investments’ portfolios continue to expand, these systems also allow for enhanced monitoring, reporting, analysis and risk management. The solid results we posted for fiscal year 2014 reflect PSP Investments’ exceptional bench strength. The team we have built in Montreal is the equal of any similar-sized pension investment organization anywhere in the world. In that regard, I would suggest our performance speaks for itself. But you need not take my word for it: in the course of my frequent travels to meet with people around the globe with whom we do business, it is gratifying to hear the near universal respect and high regard our partners express for the men and women of PSP Investments with whom they deal. The calibre of our team reflects our uncompromising efforts to identify, attract, retain and develop top-flight talent. That last part made me chuckle because Gordon sure loves traveling all around the world to meet private equity and real estate partners, racking up those air miles. And while there are many excellent employees at PSP, the organization suffered unacceptably high turnover rates for years and it failed to attract or retain many highly competent professionals in Montreal, including yours truly and plenty more who were either never considered on frivolous grounds, abruptly fired or left in disgust despite PSP's above average compensation (money isn't enough, culture is critical). Importantly, when it comes to human resources, PSP, the Caisse, CPPIB and others are unfortunately still reverting to mediocrity and they have a lot of work in terms of diversifying their workplace and improving the culture at their organizations (too many huge egos with their heads up their arse!). First, in Public Markets, the performance was pretty much benchmark in bonds and stocks. 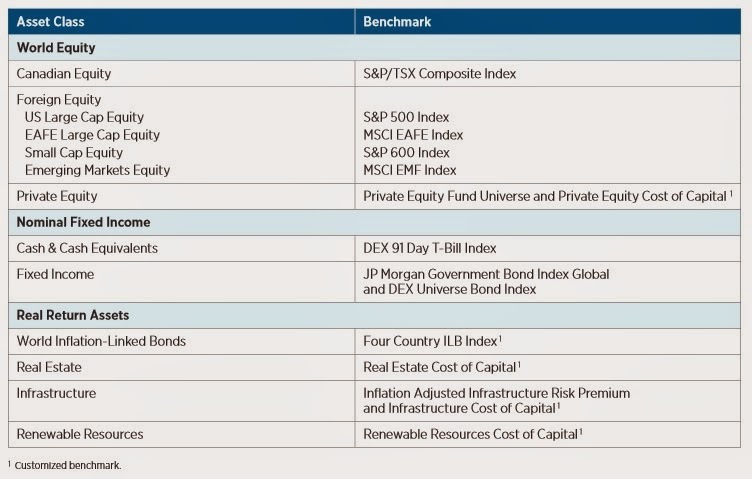 PSP indexes their Canadian stock portfolio and bonds but I noted strong outperformance in their EAFE Large Cap Equity portfolio in FY 2014 (28.3% vs 27.7%) and over the last four fiscal years (10.7% vs 10.3%). Importantly, this was the only portfolio in Public Markets with significant outperformance over the last fiscal year and last four fiscal years (bravo to Jérôme Bichut and his team!). 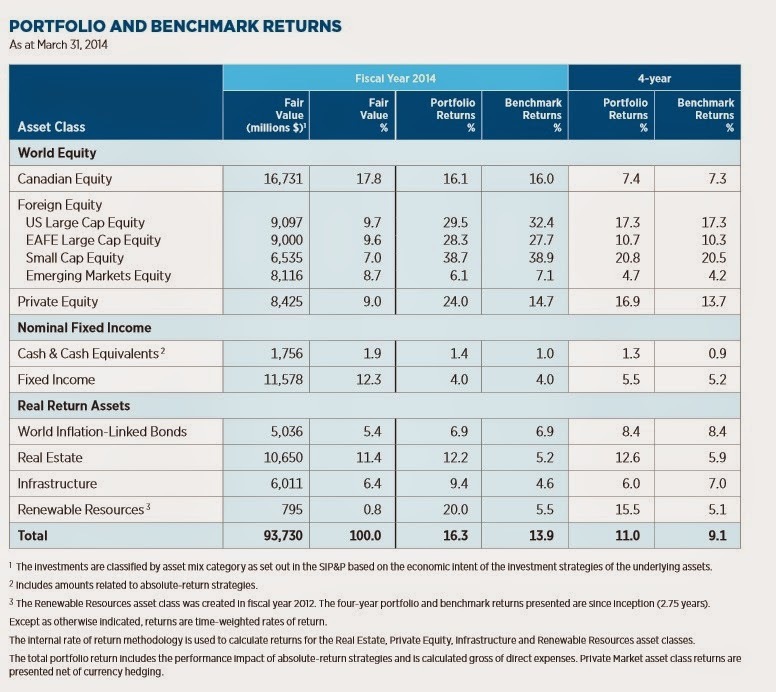 One thing that struck me in Public Markets was the significant under-performance of U.S. Large Cap Equity in FY 2014, returning 29.5% vs its benchmark return of 32.4% (an almost 300 basis points miss in U.S. large caps is crazy). Emerging Markets Equity also under-performed its benchmark by 100 basis points (6.1% vs 7.1%). In Private Markets, there was significant outperformance in FY 2014 in Private Equity (24% vs 14.7%), Real Estate (12.2% vs 5.2%), Infrastructure (9.4% vs 4.6%) and Renewable Resources (20% vs 5%). Over the last four fiscal years, the bulk of the value added that PSP generated over its (benchmark) Policy Portfolio has come from two asset classes: private equity and real estate. The former gained 16.9% vs 13.7% benchmark return while the latter gained 12.6% vs 5.9% benchmark over the last four fiscal years. What troubles me is that it has been over six years since I wrote my comment on alternative investments and bogus benchmarks, exposing their ridiculously low benchmark for real estate (CPI + 500 basis points). André Collin, PSP's former head of real estate, implemented this silly benchmark, took all sorts of risk in opportunistic real estate, made millions in compensation and then joined Lone Star, a private real estate fund that he invested billions with while at the Caisse and PSP and is now the president of that fund. And yet the Auditor General of Canada turned a blind eye to all this shady activity and worse still, PSP's board of directors has failed to fix the benchmarks in all Private Market asset classes to reflect the real risks of their underlying portfolio. Importantly, when I see such ridiculously high outperformance in any asset class, especially in private markets where benchmarks are easier to manipulate, my antennas immediately go up. None of the benchmarks governing PSP's Private Markets reflect the risks of their underlying portfolios. An easy example of this is from the points above taken from the president's report. Gordon Fyfe wrote that PSP completed the sale of its Canadian Westin hotel portfolio — one of PSP Investments’ first major real estate investments. The transaction generated solid annualized returns of close to 15% over eight years. This is an opportunistic real estate deal that easily trounced its benchmark return of roughly 5% annualized over the last eight years. 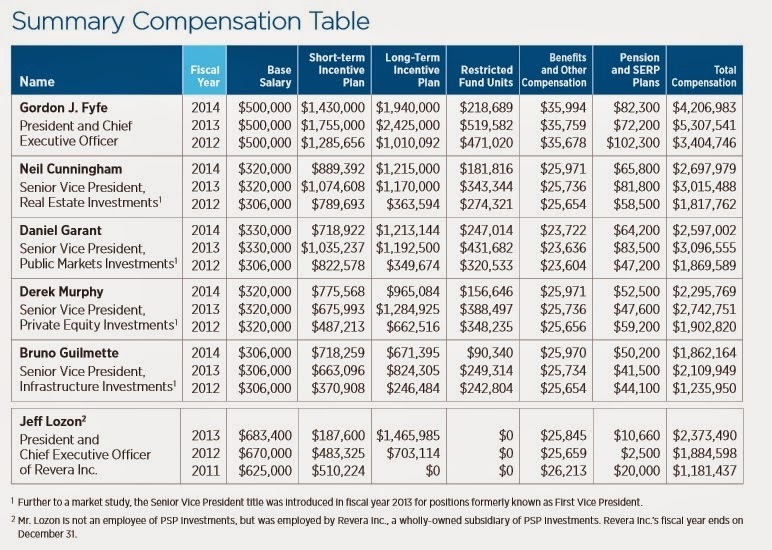 As you can see, PSP's senior executives all saw a reduction in total compensation (new rules were put in place to curb excessive comp) but they still made off like bandits, collecting millions in total compensation. Once again, Mr. Fyfe made the most, $4.2 million in FY 2014 and a whopping total of close to $13 million over the last three fiscal years. This type of excessive compensation for public pension fund managers beating their bogus private market benchmarks over a four-year rolling return period really makes my blood boil. Where is the Treasury Board and Auditor General of Canada when it comes to curbing such blatant abuses? (As explained here, the Auditor General of Canada rubber stamps financial audits but has failed to do an in-depth performance audit of PSP). The total incentive amount paid under the STIP was $36.5 million in fiscal year 2014 (465 employees), $29.9 million in fiscal year 2013 (404 employees) and $23.1 million in fiscal year 2012 (362 employees). The total incentive amount paid under the LTIP was $17.5 million in fiscal year 2014 (73 employees), $15.2 million in fiscal year 2013 (55 employees) and $6.7 million in fiscal year 2012 (42 employees). I think it's high time we stop the charade and someone commission an in-depth report on the benchmark portfolios governing all of Canada's large public pension funds. What else? We need to take a much closer look at the compensation of Canada's senior executives at some public pension funds and rein in excessive compensation. When public pension fund managers are making a base salary of a radiologist (one of the highest paid medical specialties in Canada) plus huge long-term and short-term bonuses, something is totally out of whack. Moreover, as I explained here, these are public pension funds, not private investment funds which have to worry about performance in order to raise assets. They have captive clients giving them billions to manage so I find it hard to swallow all this nonsense that they deserve these hefty payouts because they manage billions and beat some bogus benchmarks based on a four-year rolling return period. Thank god the board didn't have to fire Gordon Fyfe, it would have cost PSP millions in severance. And what happens when the new CEO comes in and wants to make changes to senior management? It will cost PSP millions. Ok, granted, these are senior managers, and if they get fired chances are they will never find another job that pays them this well, especially in Montreal, so one can argue that the severance packages are appropriate given their level of responsibility. But it's the responsibility of the board of directors to make sure compensation (and severance) isn't way out of line and reflects the risks these guys take. I've given you a lot of food for thought in this comment. I don't want to be overly critical. PSP's FY 2014 results are excellent, especially in Private Markets, where they literally trounced their bogus benchmarks, but I wanted to critically examine these results and show you how to properly read the Annual Report. Below, a rare interview with Gordon Fyfe, bcIMC's new CEO and CIO (click here if it doesn't load).